Finally more rain has arrived. The grass that greened up when cooler temperatures came in was starting to brown again with only about half an inch over the last four weeks. I don’t like fall to begin with, and a dry fall makes me want to just sit inside. Dusty flower beds doesn’t make for good transplanting and bulb planting. Other than the hardy cyclamen only the fall blooming crocus are enjoying the season. I bought these as crocus zonatus (now c kotschyanus?) and always thought they were a little under whelming until I saw a few pictures over at Cold Climate Gardening . Apparently fall crocus can be beautiful and not just a fall blooming curiosity (such as mine seem to be). A little online poking around and I found that mine are a “somewhat weedy” species known for small blooms and seeding around. I can think of worse weeds, but I guess next fall I might have to reconsider my garden’s lack of decent fall crocus flowers and maybe do something about it! In the meantime the rain and killing frosts (happened last week….) have re-inspired my garden motivation. I spent today cleaning out the dead summer vegetables and frosted summer annuals. 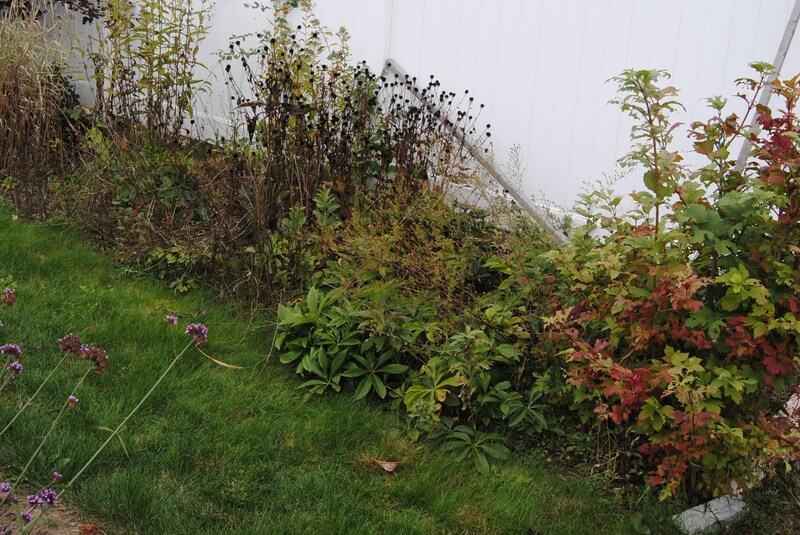 Maybe I’ll find the time and energy to tackle spots like this poorly planted, weed infested hellebore patch. This entry was posted in fall, spring bulbs and tagged crocus kotschyanus, crocus zonatus, fall blooming crocus, fall clean up, fall crocus. I don’t have any autumn bulbs, not sure why. We got some rain recently, and here as well the soil had gotten too dry. It always seems to rain just as I am on the verge of doing some watering. I’m usually a stingy waterer, mostly because it gets so tedious lugging a hose around. I usually wait for something to be near death before I break. I don’t have autumn bulbs either. Maybe I should remedy that. Being outside when the weather is dismal does me good too – raked up loads of leaves yesterday and the rain actually held off long enough! I cheated. I pulled out the mower and sucked up all the fallen leaves rather than raking. Far less relaxing, but the chopped leaves make such a nice colorful blanket for my newly cleared vegetable beds. As for the fall bulbs, maybe somewhere deep down inside I’m trying to pretend the fall bulbs are really, really, really, early spring bulbs and I’m not even facing the long cold winter! I have a few Colchicum here & there, but mostly being overwhelmed by other plants so they aren’t very showy when they need to be…..something I need to fix. We have gotten lots of rain the past few days and now it’s back down into the 30’s, not much more will be getting done here. It took a turn for cold here this morning too and I’m glad I got some things done yesterday between bowling and birthday parties. Lots of rain sounds nice right about now. Glad the rain finally came. Our fall has also been too dry, but yesterday enough rain came to knock off the leaves just as the color had peaked. No fall-blooming bulbs in my garden but I keep intending to add Spider Lilies which my grandmother used to grow. I await spring for gardening. Sorry to hear about the timing of the rain, but I think you were happy to have it anyway. Hah! I’m not too bad with impulse buys and ordering bulbs online, but the whole planting thing always gets me. I always remember bulbs around December and end up pickaxing a hole in the frozen dirt and hastily dumping them in before my fingers freeze. 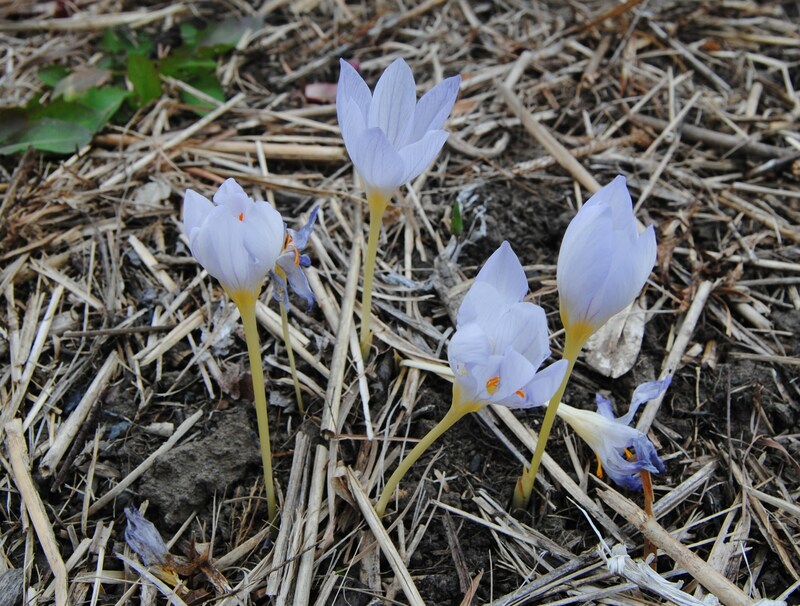 There are some gorgeous fall crocus that you can add to that bed. You have inspired me to go to the internet and look for some options for my bed along the driveway…it would be wonderful to see them there in the fall. Hi Charlie, thanks for stopping by. I’m planning for the same thing next summer. A few new ones and I can find out if it’s all just great lighting and angles or if the fall crocus can really brighten up the end of the year. We have finally gotten some rain too, but had warm weather so far this week with verbena still in bloom. I don’t have the Fall bulbs either. The mums came into flower finally this week too. I can’t imagine a crocus being weedy either 😉 they’re just too small and fleeting.